What is it with the Red Sox and Eduardo Nunez? After a nice post-trade run with Boston last year, Nunez suffered a knee injury in the first game of the ALDS against Houston and drew little interest on the free agent market. The Red Sox rolled the dice on re-signing him, and he simply hasn’t looked like the same player at any point of this year. He’s batting .261/.284/.385, and his defense has graded out terribly. The return of Rafael Devers and addition of Brandon Phillips to the roster last week should have put Nunez on the bench the rest of the year, but he’s started seven of nine games since Sept. 1. He even DH’d on Sunday. Make no mistake… he hasn’t heated up at all; he’s sporting the same OPS now that he had a month ago or two months ago. Devers has been bad, too, but at least there’s upside there. It might even be that Phillips is Boston’s best option at third at the moment. All I’m really sure of is that it’s not Nunez. I thought Devers would probably have some mixed-league value this month, but that hardly seems to be the case now, as he’s started just twice since returning last Tuesday. - Josh Donaldson is going to be a part-time player these next couple of weeks, but it seems Jose Ramirez and Jason Kipnis are now full-time second basemen and center fielders, respectively. At least, there are no plans for them to return to their old positions. Greg Allen, who has done a nice job as a source of cheap steals in recent weeks, should be returned to the scrap heap now. He could get some time over Melky Cabrera in right, but that situation should be fluid. Unfortunately, there’s been nothing to indicate that Lonnie Chisenhall (calf) is going to make it back before the end of the month. - When the Tigers declined to call up Christin Stewart in July or August, I figured we wouldn’t see him at all this year. However, the team finally did bring him up for his debut Monday. A consistent and potent bat in the minors, Stewart has finished with OPSs of .880, .883, .836 and .851 in his four seasons since being drafted, and it was particularly encouraging that he went from striking out 25 percent of the time in Double-A in 2017 to 21 percent of the time in Triple-A this year. Defense is a serious issue that holds him back as a prospect; he’s playable in left field, but he’ll always be a problem there. Having him in the same outfield as Nicholas Castellanos would be a nightmare for Tigers pitchers. Stewart is already one of the Tigers’ best hitters, though, and he should play regularly these last three weeks. He shouldn’t be of enough use in batting average or steals to be of help in mixed leagues. - The Orioles benching Adam Jones, seemingly because he refused to accept a trade before the deadline, seems like a disappointing and entirely unnecessary end to a pretty stellar career for the outfielder in Baltimore. Jones should have been moved out of center years ago and his bat is pretty average these days, but sitting him so that Joey Rickard, John Andreoli and even Jace Peterson can play is just petty. At least now D.J. Stewart is coming up and should factor into the mix. Jones has to be dropped in mixed leagues. I don’t understand why it’s come to this, though. - Stewart, a 2015 first-round pick, joined the Orioles after hitting .235/.329/.387 with 12 homers in 421 at-bats as a 24-year-old in Triple-A. He has a pretty good eye and approach at the plate, but his power hasn’t developed as hoped and he’s just a lifetime .250 hitter in the minors. He doesn’t offer much with the glove, either. There should be some offensive potential still to be unlocked here, but he’s not a major leaguer at this point. - It’s odd how little time the Astros are finding for Tony Kemp, given that he’s been their best offensive outfielder this year. He started Tuesday with George Springer absent, but it was just his second start in five days, even though Springer and Marwin Gonzalez are both banged up and Josh Reddick hasn’t done much of anything since the first half of April (Reddick is batting .233/.295/.362 with just 35 RBI in his last 108 games). Kemp’s probably a top-50 fantasy outfielder as a regular. It’s hard to use him right now, though. - Devon Travis was back in the Jays lineup against a lefty on Tuesday, but he sat out three straight games against righties previously. Even with Brandon Drury on the DL and Yangervis Solarte just returning Sunday, Travis has been plunged into a backup role. His numbers give good reason for it; he’s batting .238/.283/.392 in 332 at-bats, even though he has the lowest strikeout rate of his career. That’s because he has a .262 BABIP, which is way down from .341 in his previous three seasons. It seems at least a bit unlucky. His exit velocity stats grade out as average. He’s homered on 15 percent of his flyballs, which is pretty impressive. He’s hitting the ball on the ground way too often, but the total package still suggests he should be sporting something better than a .675 OPS. I wonder if he’ll be in the team’s plans for 2019. Since he shouldn’t make much more than $2 million, it’d be a disappointment to see him non-tendered. Still, he’s not likely to be the Jays’ first choice for second base and he hasn’t played any other position in his career. - No one seemed to have very high hopes for Adam Wainwright’s return to the Cardinals rotation on Monday, so no one was let down when he allowed four runs and struck out just two in five innings against the Pirates. Somewhat interesting was that Wainwright was throwing his curve harder and more frequently than usual. Maybe it’ll be enough to keep him in the rotation, but there’s nothing here to get excited about. - Carlos Martinez leapfrogged Jordan Hicks to become the Cardinals’ closer. It makes plenty of sense; Martinez isn’t someone you want coming in with men on base, so save him for the ninth and let Hicks remain in the role in which he’s been useful all year. The arrangement should last the rest of the season. 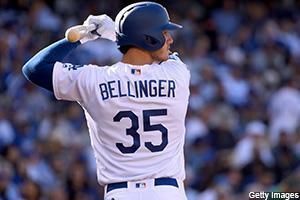 - The Dodgers turning Cody Bellinger into a platoon player after acquiring David Freese has been a nasty little surprise for his owners. Bellinger has been outstanding of late, hitting .342/.409/.547 since the beginning of August, but he was just on the bench three days in a row against southpaws. Bellinger was terrific against lefties as a rookie, hitting .271/.335/.568. He hasn’t been nearly as good this year, coming in at .222/.309/.389, but that’s partly a product of BABIP and there’s nothing all that bad in his peripherals (credit him with singles for the four times he’s reached on errors against lefties and the line jumps to .246/.330/.407). At least Dave Roberts does seem to be subbing Bellinger into games at the first opportunity whenever he doesn’t include him in the lineup. I doubt the platoon role is something that will linger into next year. - Yasiel Puig, who has had oddly awful reverse platoon splits the last two years, has also been sitting against lefties. At this point, Justin Turner and Manny Machado are the Dodgers’ only everyday players. I wonder if this is really going to pay off for the club. I’m sure the math makes sense, but taking guys who have been regulars their entire lives and sitting them three days straight seems likely to have consequences, whether they’re mental or physical. Fortunately, the Dodgers can only carry 19 position players one month of the year. - 14 months after major shoulder surgery, Julio Urias returned to the majors Monday. The early reports from his rehab assignment were very encouraging -- he was hitting 94 mph on the gun -- though they got less so as time went on and it looked like he might not be activated after he walked three and struck out none of the eight batters he faced in two appearances for Triple-A Oklahoma City (he previously had a 19/4 K/BB ratio in 10 2/3 innings at lower levels). Obviously, Urias isn’t going to be a factor in fantasy leagues this year. He’ll be a sleeper if he shows up healthy next spring, but since the Dodgers will surely nurse him along, he’s not likely to get a chance to throw 160-180 innings even if things go perfectly. - Gregory Polanco (knee) getting shut down for the season ended an exceptional 2 ½ month run for one of my favorite players this year. He hit .293/.358/.578 with 14 homers and nine steals in his final 62 games. That kind of pace over a full year would make him a top-10 outfielder. It’s not something to be counted on in 2019; injuries have been a story with him and he hadn’t done that much basestealing since his sophomore year in 2015. Still, he looks like an All-Star-type performer. Polanco’s absence will make Adam Frazier an even better play in mixed leagues the rest of the way. - Brad Boxberger’s seventh blown save Sunday cost him his gig as the Diamondbacks’ closer. It was already turning into more of a mix-and-match situation anyway, as Torey Lovullo had lost faith in Boxberger in recent weeks. Unfortunately for the Diamondbacks, Archie Bradley hasn’t been any good of late, either. Yoshihisa Hirano, who I quite liked as a closing option going into the spring, finally got his first save of the year on Tuesday and looks like the clear favorite for saves now. - Drew Steckenrider is looking terribly shaky in Miami -- he’s given up five homers in his last 13 appearances after allowing two in his first 52 -- but I’m not sure who would replace him if the Marlins opted to make a move. Kyle Barraclough was on the DL for a spell and has pitched just once in September, and Adam Conley has an 8.44 ERA over the last month. Maybe Conley sneaks in a couple of saves before season’s end, but as infrequently as the Marlins win, the situation hardly seems worthy of speculation at the moment.